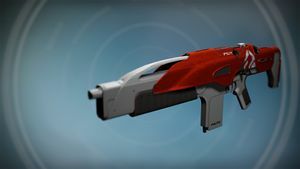 "~if(input(SIVA)) // echo Shirazi // output(death) // ask(not in vain)~"
Solar Damage - This weapon causes Solar Damage. Whirlwind's Curse - This weapon does bonus damage against Fallen. Bonus Agility when this weapon is equipped. Infuse - Consume a more powerful Weapon to boost the Attack value of this Weapon. Linear Compensator - More predictable recoil. Slight boosts to range and impact. More recoil. Accurized Ballistics - More range and impact. Increased recoil. Field Choke - More range and impact. Increased recoil. Focused Fire - When zoomed, this weapon fires slower, but causes additional damage. Speed Reload - Reload this weapon quickly. High Caliber Rounds - Oversize rounds built to stagger targets and leave them reeling. Their mass makes a weapon harder to handle. Hammer Forged - Improved range and accuracy. Focused Firefly - While Focused Fire is active, precision kills cause the target to explode.